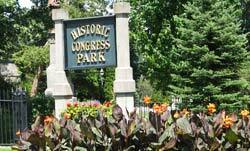 Congress Park is located on Broadway in the heart of Downtown Saratoga Springs, NY. Whether you are coming from the north or south, you can easily find your way using the directions to Congress Park below. Take Exit 15 of the (1-87 S) Adirondack Northway headed south for RT-50 S toward RT-29. Merge onto RT 50 for 2 miles. Congress Park is located at 315 Broadway in downtown Saratoga Springs. Take Exit 13N of the (1-87 N) Adirondack Northway heading north toward Saratoga Springs. Merge onto US-9 for 4 miles. Congress Park is located at 315 Broadway in downtown Saratoga Springs. Free all day parking can be found across the street along Spring Street. A parking garage on Putnam Street also offers free 2 hour parking close by. View our downtown Saratoga Springs parking map.